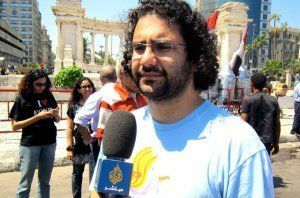 Egyptian Blogger and activist Alaa Abd El-Fattah released from prison, pending further ‎investigations into the Maspero clashes. Is it a cause for rejoicing, or is it too late to resuscitate a dying revolution? (ALEXANDRIA, Egypt) – Prominent Egyptian blogger and activist Alaa Abd El-Fattah was released from custody Sunday. His detention on 30 October stemmed from charges that included inciting violence during the bloody attack by the military on Coptic rights protesters, in what is known as theMaspero rally, on 9 October, which sparked outcry and condemnation in Egypt and around the world. Alaa also faces charges of alleged vandalism at the Maspero rally in downtown Cairo which morphed into clashes with security forces in which 27 people were killed, most of them Copts protesting over the burning of a church in the southern city of Aswan. The young activist reportedly refused to undergo questioning by the military prosecution on the grounds that the military itself was implicated in the case. 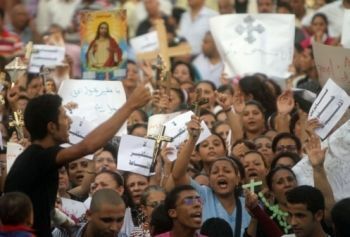 Coptic witnesses said they were fired upon by soldiers during the protest march and that several people were killed when armored vehicles ran over and crushed them. 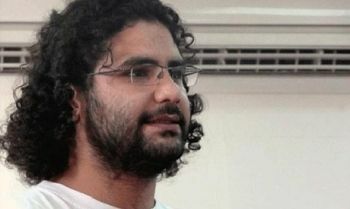 “Alaa will be released” his sister Mona Seif, who is also a political activist, said on Twitter. “Excellent news actually” I assuredly replied “The military released Alaa Abdel Fattah this morning after nearly two months of detention. His release couldn’t have come at a better time; it will surely boost the morale of all political activists who have been enduring through rough times lately in Tahrir square” I enthusiastically added. “The release of any prisoner is good news especially if he is innocent, but sir, who is this Alla abdel Fattah” the driver ingenuously asked. It is worth mentioning that the failure- up till now- of the Tahrir square revolution to produce strong and secular political leadership is one of the main reasons why the Egyptian revolution will remain to be seen as “unfinished business”. In the lack of political cadres, proper funding and charismatic leadership the Tahrir revolution has been stabbed in the back and served cold to the Islamists and the military. Meanwhile, the die-hard activists and revolutionaries can only find solace in rejoicing over the release of one of more than 12000 imprisoned activists and protesters detained and tried before military tribunals since last February.